• Laminate: $3,000 – $4,000 Laminate is affordable and offers huge variety of colors and designs. Some laminate is vulnerable to chipping, scratching, fading and aging. Replacing old or damaged laminate is cheap and even DIY-able. • Marble: $8,000 – $11,000 Marble is a classic choice for high-end countertops. But, unlike granite, marble is highly susceptible to stains and etching. • Laminate: $4,000 – $15,000 Laminate construction is similar to veneer fabrication: Laminate sheets are glued to a plywood or particleboard frame. Laminate cabinets come in both high-pressure and low-pressure options. High-pressure laminate is of higher quality and longer lasting. 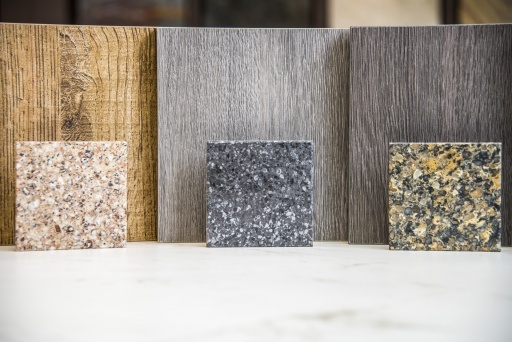 Formica and Pionite are sought-after high-end laminate brands. 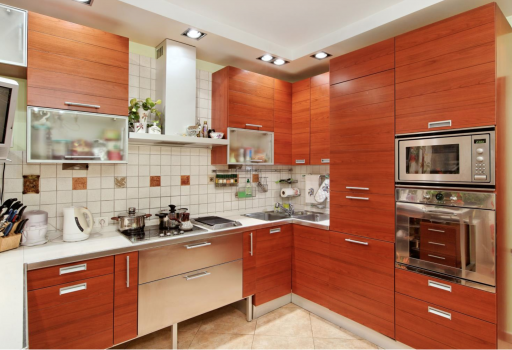 Like wood veneer, excessive moisture can damage laminate cabinets. • Semi-custom: $100 – $650 per square foot. Semi-custom cabinets require a larger budget but offer custom sizing, aesthetics and more design options than stock alternatives. Pre-fabricated elements still exist within with semi-custom cabinets, so it’s important to measure your kitchen before making a purchase. • Custom: $500 – $1,200 per square foot. Custom cabinets are built to meet your exact spatial and design needs. This construction is perfect for homeowners with a specific design and functionality needs. Installing custom cabinets is also an ideal solution for oddly shaped kitchens. • Vinyl and Linoleum: $2.50 – $3.30 per square foot (vinyl), $3.30 – $4.20 per square foot (linoleum). Vinyl and linoleum hold up relatively well over time and don’t require significant upkeep. But, unlike heavier materials like wood and tile, vinyl and linoleum are more susceptible to cuts, burns and wear. Repairing vinyl is cheap and sometimes even DIY-able. Modern vinyl and linoleum also come in simulated wood, tile and stone designs. • Natural Stone Tile: $7.50 per square foot. Natural stone’s durability and classic looks make it a popular choice for many homeowners. Stone tiles come in a huge variety of materials, including granite, marble, slate, travertine, limestone and quartz. You can repair most minor damage to natural stone with mineral oil and re-polishing. Certain materials like marble will require special care and consideration. • Laminate: $5.50 per square foot. Laminate flooring is designed to provide the look of higher-end materials without the extra cost. The composition of the laminate also makes it resistant to scratches and dents. Laminate cannot be refinished or stained. A complete replacement is necessary for a new look or to repair major damage. • Hardwood: $8.00 – $10.00 per square foot. Hardwood flooring is the number-one flooring choice for many homeowners. Wood is durable, long-lasting and able to withstand several refinishes. 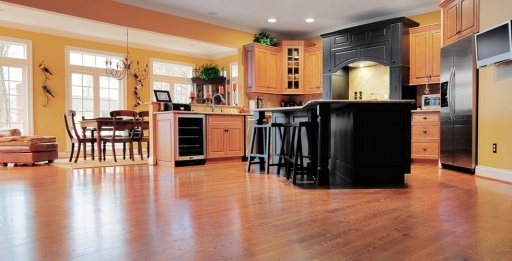 Most hardwood flooring is susceptible to scratches and moisture. Older homes with shifting foundations can also cause wood flooring to buckle and break apart. • Plumbing and Electrical Lines. Many kitchens remodel require moving water, electricity and gas lines. 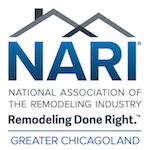 Be sure to outline any utility relocation in your plans before you begin your remodel. Moving utilities will increase your remodel budget and require the help of a pro.